Brandon Sanderson is the New York Times best-selling author of the Mistborn and Alcatraz series. He was chosen to complete the late Robert Jordan's Wheel of Times series, which has sold over 50 million copies worldwide and spawned computer, trading-card and role-playing games, a soundtrack, comic books, and numerous fan sites. 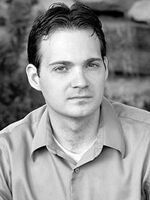 Matthew Peterson: My next guest is Brandon Sanderson, New York Times bestselling author of the Mistborn and Alcatraz series. He was chosen to complete the late Robert Jordan’s Wheel of Times series, which has sold over 50 million copies worldwide and spawned computer, trading-card and role-playing games; soundtracks; comic books; and numerous fan sites. Looks like you’ve got some big shoes to fill. Matthew Peterson: Thanks for being on the show today, Brandon. Brandon Sanderson: Thanks for having me. Matthew Peterson: Now I did meet you a while back at a convention, I can’t remember which one it was, maybe the World Science Fiction Convention and we were talking about the Wheel of Time and audiobooks and your podcasting. Brandon Sanderson: Uh huh, okay. Brandon Sanderson: But something interesting happened from that, and I just wanted to thank you, there’s something that you did that you don’t even know, you gave me some advice. At that time, I was in the middle of getting my rights back for my book, and I had an audiobook that was coming out. And you gave me some advice about how to get it onto Audible. [laughs] You probably don’t even remember that. Brandon Sanderson: Well, I hope it was good advice. Brandon Sanderson: Oh, if it was good advice, then I take credit for it. If it was bad advice then it was my evil doppelganger. Matthew Peterson: Yep. Well, you do give a lot of advice, don’t you? I mean you teach creative writing classes. Matthew Peterson: Do you still do that? Even with all this on your plate? Brandon Sanderson: I still do it. But I only teach one class a year nowadays. So, it only lasts for about three months. But I feel a need to do that because it was in that class when I was an undergraduate, long ago, that I got the final bit of information I needed, it was the final kick in the pants, so to speak, to go get published. Brandon Sanderson: It was taught by David Farland at the time who was just doing what I’m doing. He was a professional writer. He was just stepping in to teach the class for a few years. And he gave me real world publishing advice, gave the whole class real world publishing advice. A lot of creative writing classes are very touchy feely. That’s a good thing; they’ll talk about the feel of writing and how to grow a story and all of this stuff. But Dave was the first one that came in and said, “Look, you can do this for a living. I’m going to tell you how and we’re going to talk about the nuts and bolts of creating a story.” And that was wildly useful to me. And so I feel a need to go back, when I have the opportunity and explain to new writers, those same sorts of things. Matthew Peterson: Dave knows what he’s talking about too. I mean, he did the Runelords. Brandon Sanderson: Yep, Mm hmm. Which is also a New York Times bestselling success now. Matthew Peterson: Yeah! I know everybody is excited to talk about The Wheel of Time, but let’s first talk, really quickly about your Mistborn and your Alcatraz series. ‘Cause I think it’s interesting to find out where you came from before you got into The Wheel of Time. From the title, Alcatraz Versus the Evil Librarians, I get the hint that it’s little humourous. Tell us a little bit about that series. Brandon Sanderson: Well, that series is targeted a little younger, but most of my fans of it are actually older people. It’s a silly series about a kid who discovers that evil librarians secretly rule the world. Brandon Sanderson: Yeah. Let me back up and kind of explain how I work as a writer. I spent many years trying to break in, as a lot of us do, and during that decades worth of time, about, I wrote 13 novels. I was working on my 13th novel when I sold my first novel which was Elantris. Matthew Peterson: And your Mistborn series, like you said, it is more serious. Tell us a little bit about the Mistborn series. Matthew Peterson: Well, your Mistborn series did bring attention to you. I mean, that’s one of the reasons why you are writing the Wheel of Time series. Robert Jordan wrote the first one in 1990, it’s called The Eye of the World. Eleven books later, he passed on, suddenly, and left millions and millions people with their mouths open like, “Well, what’s next?” Tell us a little bit about how you jumped on board to complete the Wheel of Time series. Brandon Sanderson: Okay. I got up in the morning one day in October of 2007, fumbled downstairs to my long commute to my couch, picked up my phone to see if anyone had called me. And lo and behold there was a message from someone I didn’t know the number of. And so I picked up my phone and I listened to it and was completely dumbfounded and shocked to hear a message from Harriet Rigney, Robert Jordan’s widow, asking me if I would call her because there’s something she wants to talk to me about. To be perfectly honest, my response was something on the lines of, “Blah, blu, blahb”. Matthew Peterson: Yeah. Well, I caught Tom Doherty at a convention a couple years ago. He was alone, which doesn’t happen very often. So, I chatted to him a little bit about this. At that time it was one book, and he said, “Well, he’s actually written like close to 1,000 pages so far, and he’s only gotten like 1/3 into Jordan’s notes. So, we might have to split the book into two.” And then lo and behold, there’s going to be three books. Brandon Sanderson: It’s an enormous amount of work and we feel that fans will enjoy it better, if we give it to them 1/3 at a time, for three years. As opposed to making them wait an extra three years and then get the whole thing. Matthew Peterson: Well, you’ve got so many things to tie up. And Robert Jordan, he knew that he was going to die. He knew that, and so he was writing as fast as he could. He got these notes. And you’re working off of these notes, which is so great for the fan base, ‘cause we get a feel for what Robert Jordan had in mind. I do have one question that everyone is asking me to ask you. [laughs] Are we going to find out who killed Asmodean? Brandon Sanderson: Yes. He left notes about who killed Asmodean. To be included in the book. Harriet’s decided where it goes. I can’t tell you which of the three books it’s going to appear in. But it is going to be in there and he did write the ending himself, of the entire thing. Brandon Sanderson: Which is just wonderful. It makes this book possible because I know what the ending is. He left a lot of material through the middle too, as well. But he left that ending. He’d been promising us for years that he knew the ending of the series. And he did. And he wrote it down. And so I’m really working towards the goal of getting to that ending and working with it in mind and so, yeah, you don’t need to worry that the ending won’t be Robert Jordan’s ending, because he wrote that himself. Matthew Peterson: That is great to know. I didn’t know that. Well, that is awesome. Well, Brandon, I’ve been so glad to speak with you. I know a lot of people are really excited. The first book is The Gathering Storm, next one: Towers of Midnight, and the third one: A Memory of Light. I’ve been speaking with Brandon Sanderson, New York Times bestselling author of the Mistborn and Alcatraz series, and now The Wheel of Time series. Thank you so much for being on the show today, Brandon. Brandon Sanderson: Yeah, yeah. Thanks for having me. Matthew Peterson: Well, that’s it for today. Be sure to check out www.TheAuthorHour.com for the bonus questions that didn’t make it onto the live show. Next week I’ve got five popular authors who’ve written some of the most well-known, modern classics of our day: Anne Rice, Brian Herbert, Kevin J. Anderson, Ursula K. Le Guin, and Orson Scott Card. See ya next week!